1. Brush a light layer of glue onto the end of the lightbulb – there’s no point covering all of the bulb at this point because it’ll dry before you get to it. 2. Coil the twine a couple of times before pressing it to the end of the bottle, it’s easier to do it this way than to start coiling on the bulb itself. Hold it firmly in place for 20 seconds or so. 3. Now begin to rotate the bulb and continue to coil the twine round itself. If you’re using thicker twine you can add glue to the outer edge of each spiral as you go so that the next layer has more to stick to. 4. 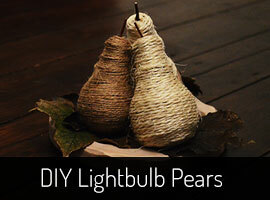 Continue this way until the rest of the light bulb is covered, coil around the top of the bulb inwards, cut the twine and wind the twine into the centre leaving a small hole. 5. Cut a length of the fresh stalk to create a short stem for the pear. Add a blob of glue into the small hole at the top of the pear and place the end of the stalk into it. You may need to hold it in place for a minute or so until the glue begins to set. 6. Leave the pear to dry completely. Repeat for as many bulbs as you have! You may even be tempted to cover an unused bulb (I may have done that for one of the above…!). I styled the pears in an autumnal theme with some fallen leaves from the garden and a wooden plate. You could also spray them gold or even green for a more natural look! 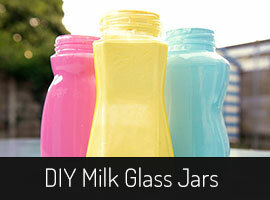 You can also employ this technique to cover all sorts of other objects like wine bottles and coffee jars – get creative!